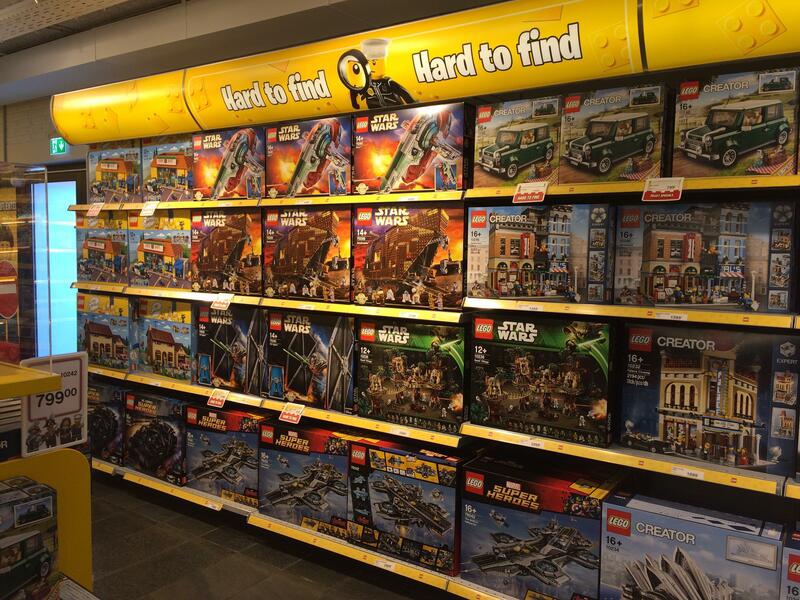 Anyone want to see the hard to find section in Legoland Billund? See photos. This isn't a recent photo is it? R2 and SSD! I took the photos on April 10th 2015; I was stood in the store as I posted them using the free wifi. ooo - I'm there on Monday - wonder if Ryan scAir will accept SSD as hand luggage hahaha. slightly off-topic - does Legoland have any sort of 'no adults without children' policy, like the Manchester Discovery Centre does? ^No. Pretty sure you're fine to go as a childless adult. How much are they charging for the SSD and R2D2? I think if you zoom in on my pictures it looks like 1499 DKK for the R2 and 3499 DKK for the SSD. Bear in mind you have to get into Legoland Billund to get to the shop though although I have a funny feeling you might be able to ask at the gate if you can just go into the shop. Some theme parks do do that and I remember signs which talked about Lego shopping outside the park. They were in Danish though. Not sure how you'd find out one way or another. LEGOland California allows under one hour visit for shopping after which you can return the regular ticket for refund (tested in 2013 ;) ) You can try to find out if the Danish one does not have something similar. "Guests that are solely interested in shopping at LEGOLAND California Resort can purchase a full price 1-day LEGOLAND only ticket at any ticket booth or Guest Services. You may spend up to 1 hour in the park and receive a full refund on your ticket purchase. Your ticket can only be refunded at the outside Guest Services window and must show that it was scanned at the turnstile within the past 60 minutes. Please note that this offer is not valid during special events such as Brick-or-Treat Party Nights (Saturdays in October)." 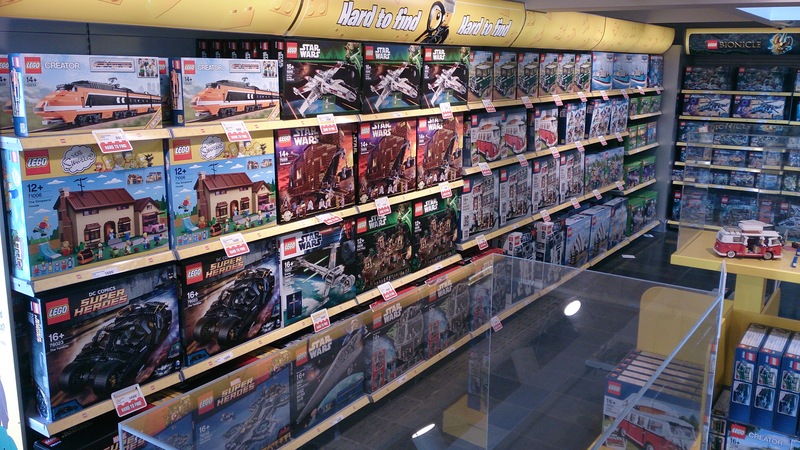 Live from Billund: no SSD's to be found, but plenty of R2D2's, and if you head to the outlet store, a mountain (2 mountains, in fact) of 2013 & 2014 star wars calendars. Which made me chuckle given the arguments I saw over getting hold of these. Don't suppose you noticed how much the advent calendars were? I was there Monday. Advent calendars were about £20. Thanks for that, I never managed to get one for myself last Christmas so I'm really pleased - only 6 days till we get there. I had read the park is free after 5pm until close (once the rides close), but now I can't verify that offer is still current. Gives you a good chance to get in a shop before the park closes. I wonder if the Lego Store going into the Lego House will also include hard to find items? Also worth noting, the shop is billed as the world's largest Lego store, but while it used to have a huge PAB wall, it's been scaled back. (And speaking of 'scale', the PAB is by weight with a wider selection so you can by a lot or just a few bricks). I've been to Legoland by myself when I was 20. Sure it felt awkward as hell but the Lego was awesome! Quick update - All old stock as per the pictures at the start of the thread are now gone... No surprise really... R2D2's, SSD and Horizon Express etc all snapped up. If anyone is looking for 10235 Winter Village Market, there are a small number at DKK799. Not holding my breath, but I hope I can score a Winter Market when we visit there in August. They even still got the B-Wing? Well, the day is upon us. We just arrived at the bricky place on Earth! I'll post what the hard to find sets are when I hit the shop after lunch. Anyone visiting Billund this weekend want to put a price on bringing me back a B-wing (I'm based in London)? I know its a bit of an ask but if I don't throw it out there then I'll never know. @sir_Bricksalot - sorry, but I'll be in the park on Sunday and will be saving my suitcase space for stuff from the employee store on Monday so can't help out I'm afraid. According to Google maps, it's a 12 hour, 19 min drive from our house. I suspect that if you got a shopping list from Bricksetters and added a few pounds per order to cover fuel, you could probably do it as cheaply as flying. Probably a nice drive too - I've not done much continental motoring, but when I have it's been quite pleasant. Nice way to spend a few days. Not sure what the deal would be with customs on the way home though, if you turned up with several thousand pounds worth of Lego in the boot. "It's all for personal use, officer!" 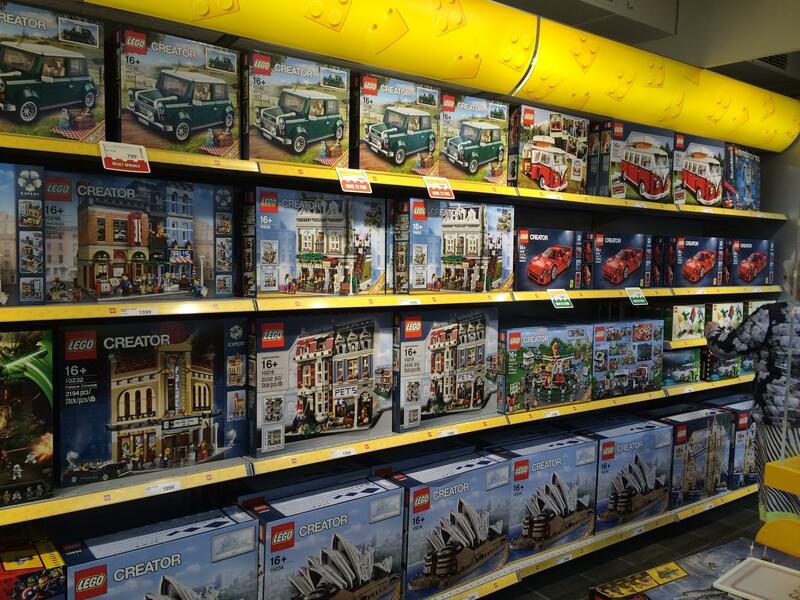 ^^ :) Technically I reckon i could spend a few thousand on Lego easily and it would all be for personal use. Just re-thought my "request" above. Please ignore it - looking at it now its quite ridiculous given the set size (my bad - apologies). Certainly not like asking if anyone can pick me up some polybags! Do they have Haunted House? Within the EU, duty only applies to alcohol, tobacco and energy. Customs officers might raise an eyebrow in personal interest, but not a professiinal one. Unless they thought it was being used for concealment. in the EU, duty only applies to alcohol, tobacco and energy. Customs officers might raise an eyebrow in personal interest, but not a professiinal one. Unless they thought it was being used for concealment. Aaaarrggghhh. Imagine buying a bulk bunch of sets only to have customs tear them open, boxes and bags. I would cry. This is my deepest and darkest fear. I'd be sobbing in a corner. Here's the current hard to find section! Nothing that's too hard to find it would seem. No, I didn't really think so either. Not much has changed since I was there other than they no longer have the Santa's Workshop set. And why would they do that? Faithful Fido and X-ray machines get their chance first if they are suspicious, and LEGO isn't something that would prove of interest to either. 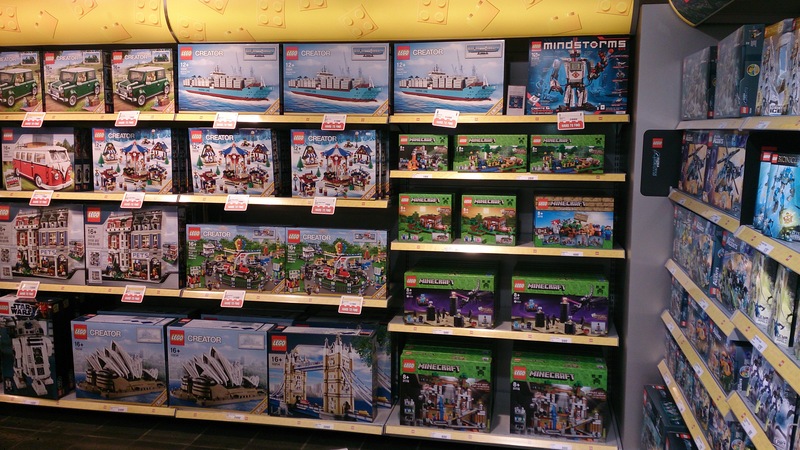 Lego is definitely expensive in Denmark, every one of those is more expensive than the RRP in Australia (yes I realise they are in Kr). We get 20-25% off pretty often too. This thread almost needs NSFW in the title. Shame they have sold the SSD and B wing now though (not that I'm going!). Was in the Lego store in Legoland Billund and they were selling #21029 Architecture Buckingham Palace, #21030 Architecture Capitol Building and also series 16 cmf. So not really a deal but first sightings in Europe. How much are those Tumblers? You might wish to look at the date of the post.